The magic of the Capri Island arrives with the new edition by Gianfranco Ferre. This year's inspiration for the creators was the mystery of this island, its passionate scents and natural beauty. The myth about irresistible Mermaids' song makes this very masculine fragrance even more mysterious. Acqua Azzurra for Men is empowered by azure wafts of aquatic accords, mirrored on the bottle and outer box as well. 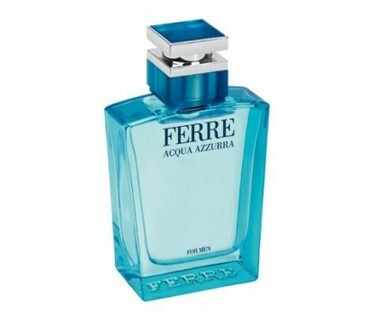 Acqua Azzurra for Men is introduced as powerful, fresh and intense. It seduces with notes of bergamot wrapped in aromatic aroma of lavender blended with orange blossom bouquet. The heart brings violet leaf, elegant notes of white rose and a touch of ginger. The base introduces sea notes, Guaiac wood and patchouli which create Mediterranean character of this fragrance. It is recommended for daytime wear.